On Friday afternoon I was delighted to go to the Dundee Flower and Food Festival. I was glad to see the festival on again this year after it was threatened with closure a couple of years ago by the council. 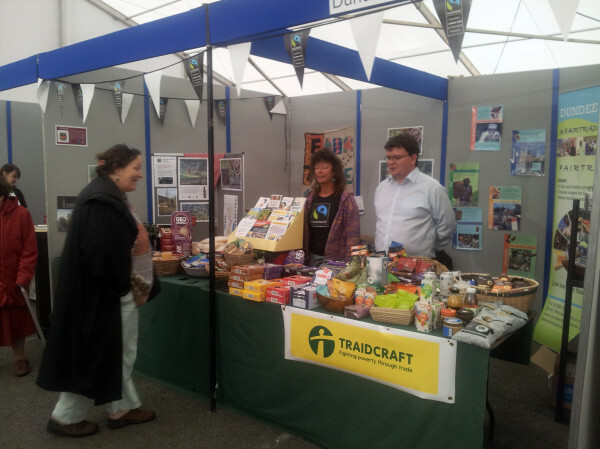 I was helping out at the Dundee Fairtrade Forum Stall. It was good to get the opportunity to promote fairtrade and remind people at the festival that it is important to know how food was produced and to have a concern for the treatment of workers right across the world. I also had the chance to visit many other parts of the festival and it was good to see so many people that I knew. 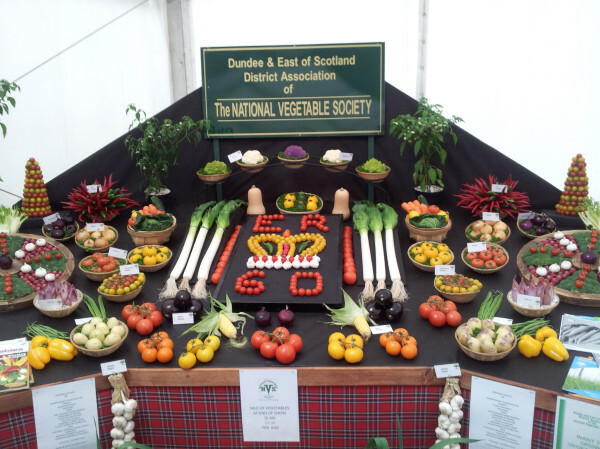 Given the weather this year it is remarkable that there was anything on display in the horticultural tents. I was delighted to see Len Jamieson who does a great deal of good work in the West End with Community Spirit at his colourful vegetable display. Len represents all that is good about the festival turning up year after year along with his fellow gardeners to show what can be done. The Festival continues on Saturday and Sunday and is well worth a visit. I hope it will go from strength to strength and I will continue to support it. The festival is popular with Dundonians and also attracts many many visitors to the city. I hope that the weather is good for the weekend. Today I managed to get to part of the Annual General Meeting of Dundee Carers Centre. The work of carers is invaluable and often goes unnoticed. It was good to listen to the stories of carers, which speak much more eloquently about the situation than politicians or fancy policy reports. Today I heard from a teenage girl who was caring for her mother and her brother and also from a man in his 80s who is caring for his wife. This demonstrates the diversity of situations which carers find themselves in. Carers often do not even realise that they are a carer, they are just doing what they think is right for someone that they love. It is important that carers get as much help and support as they can. Carers actually save public bodies a great deal of money and this should be recognised. It was good to see Dundee City Council Social Work Director, Alan Baird, at the AGM listening to the concerns of carers and commenting on these concerns. It was also good to see my Labour colleagues well represented at this event. We are committed to listening to the concerns of the people of Dundee and representing the people to the best of our ability. The Dundee Carers Centre does a great job and I am always pleased to support them. Does the City Council have a No Redundancy Policy? 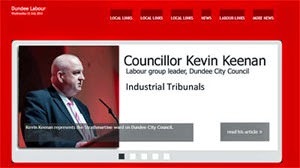 As Labour's Environment spokesperson on Dundee City Council, I am concerned about the news of redundancies at DERL. My concern comes about as the council is a major shareholder, funder and client of DERL that this sends out the message that redundancies are acceptable and that it may represent a breach in the council's long-standing no redundancy policy. I note from media reports that DERL is planning on making staff redundant. 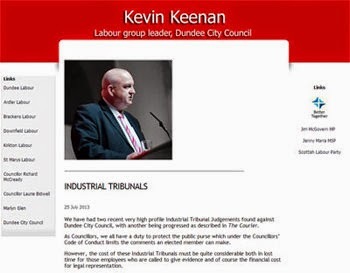 I am clear that Dundee City Council has a key role to play here as a major funder, shareholder and client of DERL I wonder whether DERL can be considered to be truly independent of Dundee City Council? If the council has a no redundancy policy, as it does, why does this not apply to DERL? The City Council across all the political parties has made it clear that jobs are a top priority and this is in the best interests of the city. If a company was planning to make 20 people redundant the council would be looking to help and looking at ways to prevent job losses. It seems strange that the City Council appears to be complicit in job losses in this case. I wonder whether the council couldn't have found alternative employment for DERL employees for the duration of the shut down at DERL. I have raised my concerns with the City Council's Chief Executive and I am looking forward to hearing from him on this matter. I am concerned that this action really brings the City Councils no redundancy plan into question. I am clear that bringing jobs to Dundee and defending the jobs that are already here is the main way to bring prosperity to the city and that it should be the top priority of everyone in the City Council. Along with my colleague Jenny Marra MSP, Shadow Minister for Community Safety and Legal Affairs, I have renewed my call for the new National Fire and Rescue Service to be headquartered in Dundee. 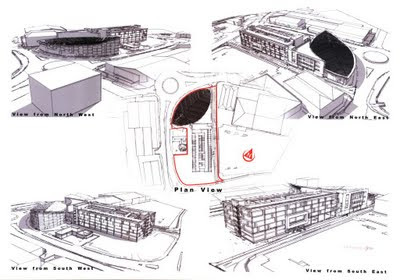 The headquarters will be the main operational hub of the new national service and will bring a significant number of civil service jobs with it. 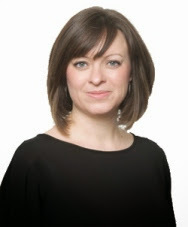 Speaking about this Jenny Marra said, “I urge the Scottish Government again to consider Dundee as the location for the new National Fire and Rescue Service headquarters. Our City is ideally located in good travelling distance of all major locations in Scotland to host a national headquarters. Dundee fits the bill and has a number of suitable sites available." “Shona Robison has called continually over the years for civil service jobs to come to Dundee and this is a great opportunity for the SNP to deliver those jobs." For my part as a member of Tayside Fire and Rescue Board I have been making the case for the national fire headquarters to be based in Dundee for some time. Dundee would be an excellent base for the national fire service. 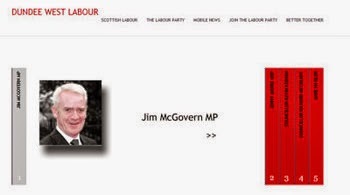 Dundee does not have its fair share of jobs from the Scottish Government. There is a fire headquarters building already in Dundee and I think that it could easily be used as the headquarters for Scotland. Dundee is easily accessible to the majority of the Scottish population and it is important that the new service serves the whole of Scotland, locating the headquarters in Dundee would send out a powerful message that this is a service for the whole of Scotland. 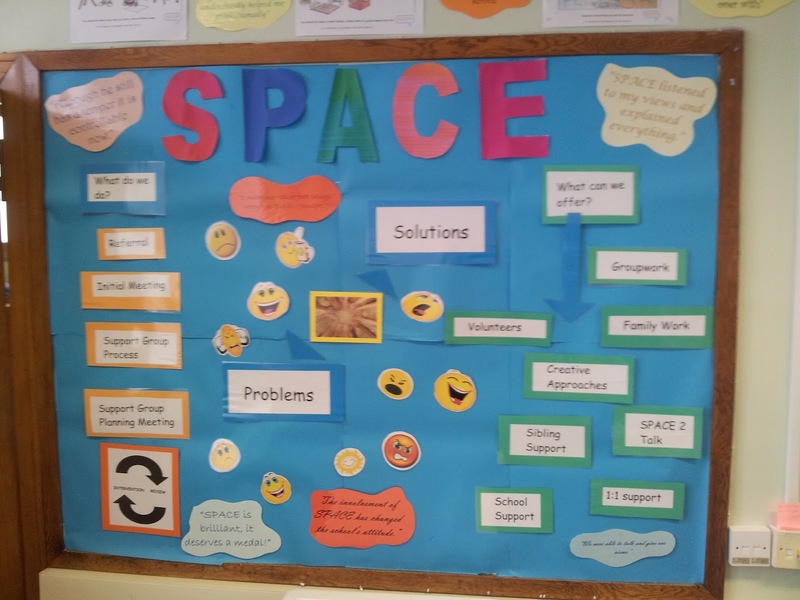 Today I visited Barnardo's Scotland's SPACE service which is based in the Dryburgh Education Centre. This is a service which supports children and their families in Dundee who are experiencing significant difficulties at home, in school or in the community. This is really interesting service which offers support to young people in some difficulty and hopefully allows them to remain in school and to flourish. Early intervention is essential and it was good to hear about the work of staff and volunteers who make a real difference to the lives of young people in our city. This evening I was really pleased to join some of my council colleagues to visit the University of Dundee Botanic Gardens as a guest of the Friends of the Botanic Gardens. I have visited the gardens previously and I think that they are a great resource for the city and the West End and should be publicised more. I am glad that the University of Dundee is giving more clear cut support for the Botanic Gardens than it did when I was first elected in 2007. 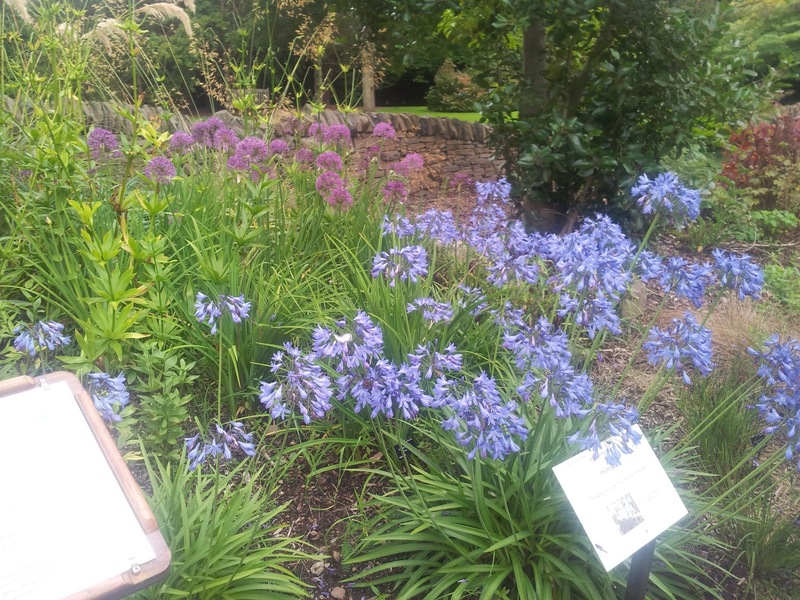 The Botanics are well worth a visit and I am keen to work with the Friends of the Botanic Gardens to promote them and ensure their ongoing viability. The Friends of the Botanic Gardens do a fabulous job and certainly did much to save the gardens when they were under threat. Today I attended a meeting of the project board for the new Olympia. This included a site visit. The building is now very much taking shape and it is now possible to clearly see the swimming pools and the flumes taking shape. I think that this is an exciting development for the city, I am proud to have been responsible for bringing forward the proposals for the new pool in the first place. This is an important development for the city and I look forward to its completion. I think that the City Council should be looking for other developments to bring forward which would boost the economy of the city. Guarantee that procurement plans start to benefit local jobs through a radical community benefit approach. 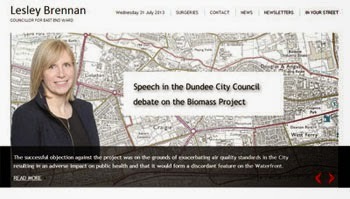 Come clean on the status of long-promised renewables jobs for Dundee. Publish an urgent plan for growth and employment for Dundee. It is important that we put Dundee First and make the case for jobs for Dundee. Dundee City Council needs to take the lead and use its purchasing potential to invigorate the Dundee economy. The City Council needs to look at bringing forward proposals for construction work for schemes like the replacement Harris Academy and also look towards building other new schools in the city. We should also look at bringing forward developments in the waterfront which bring jobs to Dundee. 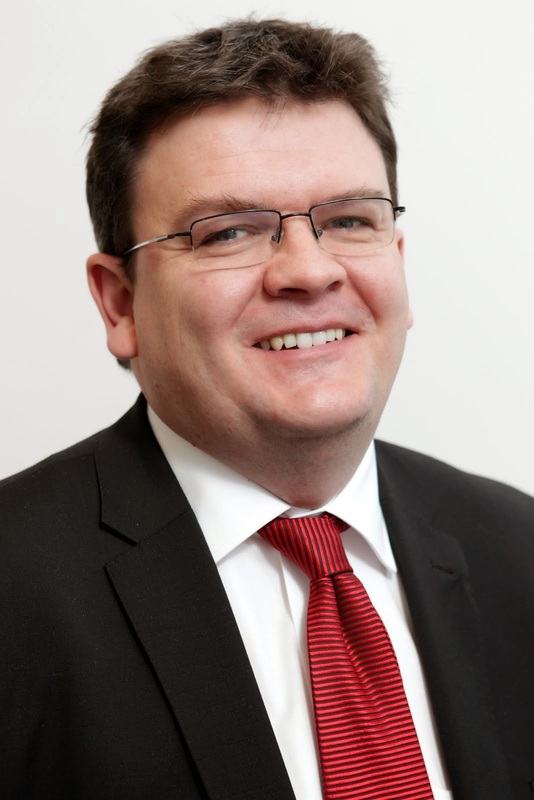 The council should also ensure that it uses its purchasing power in the interests of the people of Dundee and develops a policy on community benefit in procurement which allows the council to give local businesses a chance to win contracts from the council. Labour in Dundee is willing to work with anyone with the city's best interests at heart to deliver and secure jobs for Dundee. This afternoon I visited Dundee Women's Aid which is based in the West End ward. Recently Scottish Women's Aid wrote to councillors and gave a briefing about their work and suggested that local councillors might want to meet up with their local women's aid service. I was pleased to get the chance to hear about the work of Dundee Women's Aid; I am disappointed that their services are required, but I know they do a great job. I am clear that there can never be any excuse for violence against women and that we need to look at ways in which we can educate men that violence against women is never acceptable. It was good to hear about the support which can be given to women and families in need. I will be raising a number of issues with the City Council and others to see if they have are able to help Dundee Women's Aid even more. You can see how you could help Dundee Women's Aid here. This morning I attended a meeting of Tayside Fire and Rescue Board in Forfar. I was pleased to be able to congratulate the Chief Fire Officer on his appointment as the first Chief Officer of the new Scottish Fire and Rescue Service, I am sure that Alasdair Hay will do a great job but he is faced with many challenges. 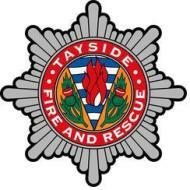 There will be more developments in the management structure of Tayside Fire and Rescue over the next couple of weeks which will allow the service to operate until next year.